Life by the Creek: Sometimes, the simple stuff is the best. Sometimes, the simple stuff is the best. With this pregnancy, I have not really been able to eat eggs for breakfast. They gross me out. And, cereal makes me sick. So, I've turned to eating leftovers for breakfast. This morning, my leftovers were awesome. 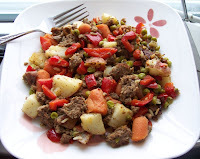 I had ground beef, carrots, potatoes, a smattering of peas and rice, and I also cut up half a red pepper. Heated it in a little grapeseed oil, sprinkled on some celery seed, garlic salt and pepper, and there you go. I could eat it all the time. Except, now I don't have any more of those things in tiny containers in the fridge. ;) Hopefully whatever I can come up with tomorrow will be equally delicious. Oh! That looks like SUCH a yummy breakfast! I hear you on the eggs thing. Blech. Yesterday I had pizza for breakfast. Tyler took me out for pizza Friday night, and of course I ordered it with a little bit of everything.. pineapple, olives, hot peppers, mushrooms, you know... all the stuff he doesn't like. He got his own boring cheese & pepperoni one. Anyways, I had it for breakfast, and it was SO good. Sometimes leftovers make the best breakfasts. Pizza for breakfast is awesome. I know! Once I tried to trick him by cutting up a red pepper really small and hiding it under the cheese, but he found it and picked it out. The little rotter. It's his mom's fault, she's just as bad. SO picky! I know I'm picky, but they are a hundred times worse. Ty's Dad is just happy that now he has someone who will actually eat the stuff that he grows in the garden. HA!